In Hinduism, an avatar or avatara (Sanskrit अवतार), is the incarnation (bodily manifestation) of an Immortal Being, or of the Ultimate Supreme Being. It derives from the Sanskrit word avatāra which means «descent» and usually implies a deliberate descent into mortal realms for special purposes. The term is used primarily in Hinduism, for incarnations of Vishnu the Preserver, whom many Hindus worship as God. The Dasavatara (see below) are ten particular «great» incarnations of Vishnu. Unlike Christianity and Shaivism, Vaishnavism believes that God takes a special (including human) form whenever there is a decline of righteousness (dharma) and rise of evil. Lord Krishna, an avatar of Vishnu, according to Vaishnavism that is espoused by Ramanuja and Madhva, and God in Gaudiya Vaishnavism, said in the Gita: “For the protection of the good, for destruction of evil, and for the establishment of righteousness, I come into being from age to age.” (Bhagavad Gita, Chapter 4, verse 8.) In any event, all Hindus believe that there is no difference between worship of Vishnu and His avatars as it all leads to Him. The word has also been used by extension to refer to the incarnations of God in other religions, notably Christianity, for example Jesus. 5 The Ninth Avatar: Balarama or Buddha? This doctrine has had a great impact on Hindu religious life, for to many it means that God has manifested Himself in a form that could be appreciated even by the least sophisticated. Rama and Krishna have remained prominent as beloved and adored manifestations of the Divine for thousands of years among Hindus. The Upanishadic concept of the underlying unity of Brahman is revered by many to be the pinnacle of Hindu thought, and the concept of the avatars has purveyed this concept to the ordinary Hindu as an expression of the manifestation of the Hindu’s highest single divinity as an aid to humanity in difficult times. The Hindu cycle of creation, evolution, and destruction contains the essence of the idea of «avatars» and indeed relies on a final avatar of Vishnu, that of Kalki, as the final evolutionary avatar before destruction at the end of the world. The Maha Avatara (Great Avatars) of Vishnu are usually said to be ten and this is popularly known as the Dasavatara (dasa (dasha) in Sanskrit means ten). The first four of the ten avatars have appeared in the Satya Yuga (the first of the four Yugas or epochs that comprise one Mahayuga — for more details please read the section above on Lord Brahma). The next three avatars appeared in the Treta Yuga, the eighth incarnation in the Dwapar Yuga and the ninth in the Kali Yuga. The tenth is expected to appear at the end of the Kali Yuga. Matsya, the fish, appeared in the Satya Yuga. Kurma, the tortoise, appeared in the Satya Yuga. Varaha, the boar, appeared in the Satya Yuga. Narasimha, the Man-Lion (Nara = man, simha = lion), appeared in the Satya Yuga. Vamana, the Dwarf, appeared in the Treta Yuga. Parashurama, Rama with the axe, appeared in the Treta Yuga. Rama, Sri Ramachandra, the prince and king of Ayodhya, appeared in the Treta Yuga. Krishna (meaning dark or black; see also other meanings in the article about him. ), appeared in the Dwapar Yuga. Balarama (meaning one who holds a plough). Balarama is said to have appeared in the Dwapar Yuga (along with Krishna). Kalki («Eternity», or «time», or «The Destroyer of foulness»), who is expected to appear at the end of Kali Yuga, the time period in which we currently exist, which will end in the year 428899 CE. The Puranas list twenty-five avataras of Vishnu. A description of these is found in the Bhagavata Purana, Canto 1. According to Vaishnava doctrine, there are two type of avatars, primary avatars and secondary avatars. 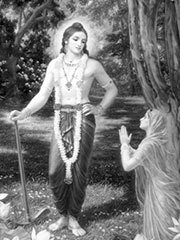 The most common type of primary avatars are called Svarupavatars, in which He manifests Himself in His Sat-cid-ananda form. In the primary avatars, such as Narasimha, Rama, Krishna], Vishnu directly descends. The Svarupavatars are subdivided into Amsarupavatars and Purna avatars. In Amsarupavatars, Vishnu is fully present in the body but He is manifest in the person only partially. Such avatars include the first five avatars from Matsya to Vamana except for Narasimha. Narasimha, Rama and Krishna, on the other hand, are types of Purna avatars, in which all the qualities and powers of the Lord are expressed. Narasimha and Rama are also additionally considered to be Lila avatars. See Krishnology. Other avatars are secondary avatars, such as Parashurama in which Vishnu does not directly descend. Parashurama is the only one of the traditional ten avatars that is not a direct descent of Vishnu. There are two types of secondary avatars: 1) Vishnu enters a soul with His form. (e.g., Parashurama) or 2) Vishnu does not enter a soul with His own form, but gives him extraordinary divine powers. (e.g., Veda Vyasa.) The secondary avatar class is sometimes called Saktyamsavatar, Saktyaveshavatar or avesha avatar. Note that the secondary avatars are not worshipped. Only the direct, primary avatars are worshipped. However, in practice, the direct avatars that are worshipped today are the Purna avatars of Narasimha, Rama and Krishna. Krishna, among most Vaishnavites, is considered to be the highest kind of Purna avatar. However, followers of Chaitanya (including ISKCON), Nimbarka, Vallabhacharya differ philosophically from other Vaishnavites, such as Ramanuja and Madhva and consider Krishna to be the ultimate Godhead, and not simply an avatar. In any event, all Hindus believe that there is no difference between worship of Vishnu and His avatars as it all leads to Him. References are cited and given below. A number of people in more recent times have are considered to be avatars by themselves or by others. See List of other people considered to be avatars. The Ninth Avatar: Balarama or Buddha? Balarama is the ninth avatar according to Puranic tradition. According to Puranas, Buddha is never considered as a part of Dasa Avatar. However, as of the early centuries AD, Buddha is considered the Ninth Avatar, and Balarama and Krishna Share the Eighth spot. Many claim that the ten avatars represent the evolution of life and of mankind on earth. Matsya, the fish, represents life in water. Kurma, the tortoise, represents the next stage, amphibianism. The third animal, the boar Varaha, symbolizes life on land. Narasimha, the Man-Lion, symbolizes the commencement development of mammals. Vamana, the dwarf, symbolizes this incomplete development of human. Then, Parashurama, the forest-dwelling hermit armed with an axe, connotes completion of the basic development of humankind. The King Rama signals man’s ability to govern nations. Krishna, an expert in the sixty-four fields of science and art according to Hinduism, indicates man’s advancement in culture and civilization. Balarama, whose weapon was a plough could stand for the development of agriculture. Buddha, the enlightened one, symbolizes social advancement of man. Note that the time of the avatars also has some significance: Thus, kings rule reached its ideal state in Treta Yuga with Rama Avatar and social justice and Dharma were protected in Dwapar Yuga with the avatar of Krishna. Thus the avatars represent the evolution of life and society with changing epoch from Krita Yuga to Kali yuga. The animal evolution and development connotations also bear striking resemblances to the modern scientific theory of Evolution. For more details on this topic, see List of people considered to be avatars. Chaitanya (1486-1534) is claimed to be an avatar of Krishna by the Gaudiya Vaishnavism sect. He is also known as the ‘Golden Avatar’. His appearance, by his followers, is said to be predicted in the latter texts of the Srimad Bhagavatam. For more information, see Gaudiya Vaishnava Theology. Ayya Vaikundar (1809-1851) According to Akilattirattu Ammanai, the religious book of Ayyavazhi, Lord Vaikundar arose from the sea as the Avatar of Narayana. Sri Ramakrishna (1836-1886) and Sri Sarada Devi (1853-1920). Ramakrishna is reported to have said to Swami Vivekananda, «He who was Rama and Krishna is now, in this body, Ramakrishna.» Sarada Devi, who was married to Ramakrishna in a traditional Indian child marriage, is likewise considered by many to be an incarnation of Kali. This pairing of contemporaneous avatars is rare if not unique in Hindu history. Ramakrishna, Sarada Devi, and Vivekananda are worshipped by devotees worldwide as a , the latter not as an avatar but as someone who has obtained moksha, total enlightenment and liberation from samsara, the cycle of birth and death. Zoroaster (Zarathustra) the prophet of Zoroastrianism. Mahavira (599 BC-527 BC) originator of the tenets of Jainism. Gautama Buddha (563-483BC-543BC) the key figure in Buddhism. See Sarvepalli_Radhakrishnan and Vaishnava Theology. Jesus (4 BC-36) whose teachings inspired Christianity. Muhammed (570-632) the prophet of Islam. Bahá’u’lláh (1817-1892) the founder-prophet of the Bahá’í Faith, believed to be Kalki Avatar. Many new religious movements related to Hinduism (see Contemporary Hindu movements), many of them cults, have more contentious views, including a tendency in modern times to place their guru as ishta-deva. This is of course an unpopular view both in the minds of orthodox Hindus, as well with outsiders who often misunderstand this phenomenon as a tendency common within Hinduism. The avatar doctrine has been excessively abused by many Hindus today and we have the strange phenomenon of every disciple of a sectarian Guru claiming him to be an avatar. Christianity has therefore limited the Divine Incarnation as an one-time phenomenon. The theory has strong points and equally strong defects but it surmounts the gross abuse of the doctrine indulged in by many Hindus. Thus, if followers respect and revere the guru, it is only proper if they are using him as a conduit to God, and respect him as a teacher. However, Swami Sivananda has said that a guru can be likened to God if he himself has attained realization and is a link between the individual and the Absolute. Such a guru, according to his definition and interpretation, should have actually attained union with God, inspire devotion in others, and have a presence that purifies all. Such a case is limited in contemporary times. Bhakti Schools of Vedanta, pg. 94, by Swami Tapasyananda, available at Sri Ramakrishna Math, Chennai. available at India web site: and US site: . Gupta, Mahendra. Hans Puran, (1969) New Delhi.